iPhone 5 dock connector: The one incredibly irksome feature that will leave you cursing Apple. The one incredibly irksome feature that will leave you cursing Apple. Photograph by Justin Sullivan/Getty Images. I get why Apple needed to change the connector. But man is this going to be a pain. Like every other gadget user on the planet, I’ve accumulated a host of accessories to accommodate Apple’s old dock. Among them, my car (which features an old-style dock connector in the glovebox) and my clock radio. I’ve also got lots of charging cords sitting around my house, all designed to power up my phone and iPad wherever I go. Now all those things—tens of millions of iOS-compatible accessories—have been rendered obsolete. The only way to plug the new iPhone and iPods into gadgets bearing the old dock is to buy an ungainly adapter. Apple will sell you the adapter for $29, which is the definition of being unfriendly to your customers. Apple has a long history of killing technologies that it deems obsolete. In the 1990s, it got rid of floppy drives from the iMac even though some people still stored a lot of their data on disks. The first MacBook Air didn’t include a DVD drive or an Ethernet port. But while those omissions were initially frustrating, they were defensible, because in those cases Apple was going along with clear trends in technology. Everyone knew that floppy drives and optical media would be obsolete; Apple was just moving faster than everyone else. But I don’t think that defense applies with the dock. In this case, Apple is just moving from one closed, proprietary standard to another, causing endless hassles and minimal benefits for users. If Apple really believed that the old dock was too big for its newer devices, it should have replaced them, once and for all, with the tech industry’s standard way to connect stuff: USB. That connection system comes in various sizes, including one (micro-USB) that is found on almost every non-Apple phone in the world. It’s true that USB isn’t reversible—you can only plug it in one way. Other than that, though, it would have worked just as well as Apple’s new dock, with the added benefit of being universal. If Apple had gone with USB, the world would have been a much better place: Everyone’s phone would be able to use the same charging plugs. There’d be a standardized way to get every device to plug into every other device—your iPad would be able to connect to your TV, no matter the make and model, or your iPhone could plug into your camera, letting you get all your pictures in an instant. What’s more, because USB is an open standard, accessory makers wouldn’t have had to get approval from Apple before coming up with new stuff. That, of course, explains why Apple didn’t go with USB. By picking a proprietary dock, Apple will remain in charge of the bustling accessory market. Not only will it get to keep charging accessory makers a licensing fee to connect with its devices, but it will also be able to reject any accessories that it doesn’t like. And one day in the future, it will be able to decide, once again, to throw the whole industry under the bus by changing the dock again. This incredibly annoying new dock connector isn’t going to hurt sales of the iPhone 5. But it’s still bogus, and it’s revelatory of Apple’s belief that the people who buy its gadgets are cash registers. So no, this isn’t the best iPhone ever. 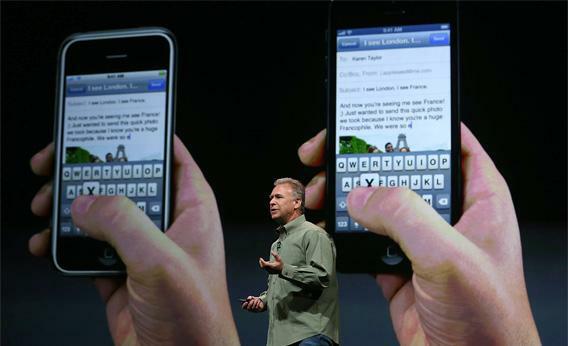 If it was, it wouldn’t have screwed over Apple’s most loyal customers.